Acid attack on Bolshoi theatre artistic director | Russian Legal Information Agency (RAPSI). Sulfuric acid was heaved in the face of Bolshoi Theater artistic director Sergei Filin as he attempted to enter his home in January 2013. As a result of the assault, Filin suffered third degree burns to his face and eyes. In March the Interior Ministry announced the arrests of the alleged perpetrators of the attack. One of them was the leading Bolshoi dancer Pavel Dmitrichenko. The rivalry allegedly occured over a girl. 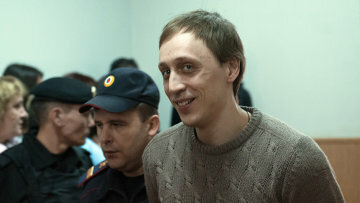 12:32 04/03/2015 Driver Andrei Lipatov, who had been convicted and sentenced for his role in an attack on artistic director of Russia's Bolshoi Ballet Sergei Filin, was released on Wednesday. 16:06 06/03/2014 The Moscow City Court on Thursday mitigated the sentence handed down by the Meschansky District Court in the case over the attack on the Bolshoi Ballet artistic director Sergei Filin, RAPSI reports from the court. 15:53 27/02/2014 The Moscow City Court will consider the complaints against the verdict in the case over the attack on the Bolshoi Ballet artistic director Sergei Filin on March 6, RAPSI reported from the courtroom Thursday. 12:22 13/12/2013 The defense of the leading Bolshoi Ballet soloist Pavel Dmitrichenko, convicted for masterminding an attack on the ballet's artistic director Sergei Filin, has asked a court to overturn his sentence. 12:50 10/12/2013 The leading soloist of Bolshoi Pavel Dmitrichenko, convicted for masterminding an attack on the ballet’s artistic director Sergei Filin, will not be subject to amnesty proposed by Vladimir Putin. 15:18 29/11/2013 Bolshoi Ballet leading soloist Pavel Dmitrichenko, who stands accused of masterminding an acid attack on Bolshoi Artistic Director Sergei Filin has already paid him 50,000 rubles (over $1,500) in compensation. 15:02 29/11/2013 The prosecutor demanded a 9-year prison sentnece for Bolshoi Ballet leading soloist Pavel Dmitrichenko accused of masterminding an acid attack that left Bolshoi Artistic Director Sergei Filin with third degree burns to his face and eyes. 18:50 28/11/2013 RAPSI is hosting a live text broadcast of closing arguments in the case of the acid attack that left Bolshoi Artistic Director Sergei Filin with third degree burns to his face and eyes. 16:50 22/11/2013 RAPSI is broadcasting live the testimony of former top Bolshoi Ballet dancer Nikolai Tsiskaridze, as well as the continued testimony of former leading soloist Pavel Dmitrichenko, in the trial of acid attack that left Bolshoi Artistic Director Sergei Filin with third degree burns to his face and eyes. The hearing is taking place at Moscow's Meschansky District Court, starting at 14:00 Moscow time. 16:39 21/11/2013 Moscow's Meschansky District Court on November 22 is questioning Bolshoi Ballet leading soloist Pavel Dmitrichenko, who stands accused of masterminding an acid attack that left Bolshoi Artistic Director Sergei Filin with third degree burns to his face and eyes. RAPSI is on the scene reporting live. 17:33 20/11/2013 Former top Bolshoi Ballet dancer Nikolai Tsiskaridze will give testimony before Moscow's Meschansky District Court on November 25 in connection with an acid attack that left Bolshoi Artistic Director Sergei Filin with third degree burns to his face and eyes. 14:25 05/11/2013 RAPSI is hosting a live text broadcast as Bolshoi Ballet Artistic Director Sergei Filin appears in a Moscow court to testify about the acid attack that nearly blinded him earlier this year. 10:20 18/10/2013 Bolshoi Ballet leading soloist Pavel Dmitrichenko accused of masterminding an acid attack that left Bolshoi Artistic Director Sergei Filin with third degree burns to his face and eyes was beaten after the pre-trial hearing by guards. 12:06 17/10/2013 Bolshoi Ballet leading soloist Pavel Dmitrichenko accused of masterminding an acid attack that left Bolshoi Artistic Director Sergei Filin with third degree burns to his face and eyes will go on trial on October 22 along with his alleged accomlices. 08:41 10/06/2013 Ballet star Nikolai Tsiskaridze who will have to leave the Bolshoi Theater at the end of the month said on Sunday he is being hounded by the management over a conflict after an acid attack on the artistic director. 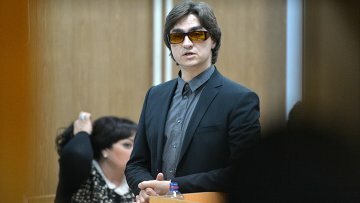 10:00 14/05/2013 The lawyers of Pavel Dmitrichenko, who is suspected of masterminding the attack against Bolshoi Theater Artistic Director Sergei Filin, plan to contest the forensics results which claim the attack caused serious bodily harm. 17:02 19/04/2013 Two people accused of attacking Bolshoi Ballet Artistic Director Sergei Filin in January have appealed the motion to extend their detention. 18:28 16/04/2013 The detentions of Bolshoi Theater leading soloist Pavel Dmitrichenko and two others have been in connection with the acid attack against artistic director Sergei Filin have been extended. 16:52 15/04/2013 RAPSI will be live on the scene as Moscow's Tagansky District Court decides whether to extend the detention Bolshoi Theater leading soloist Pavel Dmitrichenko and two suspected accomplices in connection with the brutal acid attack that left Bolshoi Artistic Director Sergei Filin with third degree burns to his face and eyes. 17:00 19/03/2013 The attorney of Andrei Lipatov, who has been accused of involvement in the January 17 acid attack on the Bolshoi Theatre's artistic director Sergei Filin, has refused to sign a non-disclosure agreement. 12:46 18/03/2013 Bolshoi Theater artistic director Sergei Filin, the victim of an acid attack, claims that top dancer Nikolai Tsiskaridze threatened him with a compromising audio tape, alluding to the fact that the world-famous principal dancer might have been in on the attack. 10:22 15/03/2013 The Moscow police have called on the parties involved in the case of the attack against Bolshoi Theater Artistic Director Sergei Filin not to make conjectures because they could influence the course of investigation. 16:27 06/03/2013 RAPSI is live on the scene as Moscow's Tagansky District Court is expected to issue a decision today on the detention of Bolshoi Theater leading soloist Pavel Dmitrichenko and two suspected accomplices in connection with the brutal acid attack that left Bolshoi Artistic Director Sergei Filin with third degree burns to his face and eyes. 10:28 06/03/2013 Bolshoi Ballet leading soloist Pavel Dmitrichenko and two others have been detained in connection with the recent acid attack against Artistic Director Sergei Filin. 10:45 05/03/2013 Police in Moscow have detained a suspect over a horrific acid attack on the Bolshoi Theater’s artistic director. 14:33 28/01/2013 Police plan to use a polygraph when interrogating witnesses in investigating the acid attack on Bolshoi Theater artistic director Sergei Filin. 12:02 22/01/2013 Bolshoi Theater Artistic Director Sergei Filin, who is in hospital after acid was thrown in his face, says he does not know who his attackers were, but thinks the incident was connected with his work. 12:30 18/01/2013 Bolshoi Theater Artistic Director Sergei Filin suffered third degree burns to his face and eyes early Friday morning when an unknown assailant attacked him with what is believed to have been concentrated acid.